Michael Baker International provided design and construction phase engineering support services for 15,500 linear feet (LF) of 24-inch potable water and 20-inch recycled water transmission pipelines (cement mortar lined and coated welded steel), one 3.0-MG potable Zone II water welded-steel tank, and one 2.0-MG recycled Zone B water welded-steel tank. The project included 163,000 cubic yards (CY) of earthwork, plus 102,000 CY of remedial grading for construction of a 7,500 LF all-weather access road and tank pad. The pipeline and roadway construction also required the relocation of 700 LF of an existing 18-inch sanitary sewer pipeline, which serves the entire Coto de Caza community of approximately 15,000 residents. Additional operational and emergency (fire protection) water supply was required to meet the needs of existing and proposed development in the Escencia Village in Rancho Mission Viejo, which also utilizes recycled water to meet irrigation and other non-potable water demands. The project had an accelerated schedule, and included three separate construction packages to ensure that the potable water and recycled water facilities would be constructed and operational prior to the summer of 2017. Also, significant coordination with USFW and construction monitoring were required to minimize environmental impacts and provide native habitat restoration. The project faced several challenges, including the need to maintain continuous flow in the sewer system during the relocation of 700 LF of 18-inch sanitary sewer. In response to this challenge, a detailed bypass plan was developed, including a spill prevention plan and emergency spill response plan. Because no public utility facilities exist in this area, four photovoltaic (solar) systems were designed to provide power for cathodic protection rectifiers and reservoir telemetry equipment. Lastly, design and construction required coordination with the construction of Los Patrones Parkway, which includes a 50-foot high fill over the pipeline alignment. 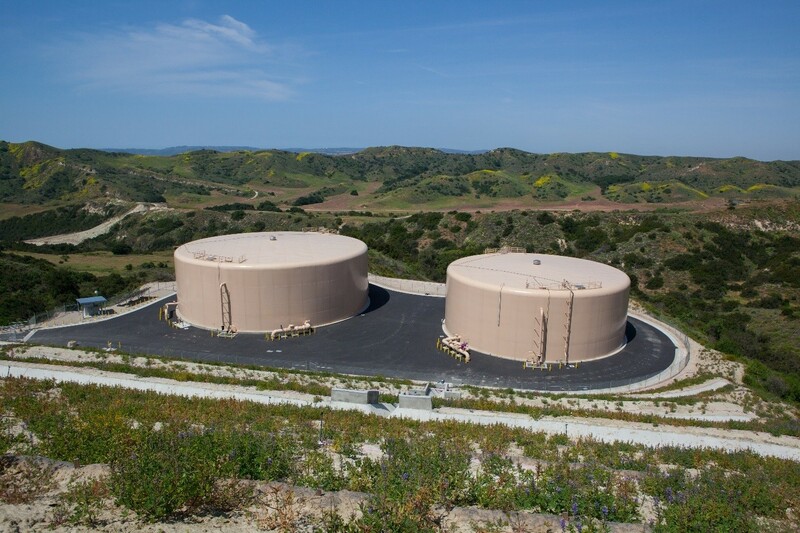 The Tesoro Zone II and Zone B Water Facilities project demonstrates Santa Margarita Water District’s proactive approach to implementing infrastructure improvements and maximizing their available water supply resources to best serve their customers. The new facilities increased operational and emergency storage, as well as supply reliability for SMWD’s potable and recycled water system. Many technical and non-technical challenges were overcome throughout the development and construction of the project, including meeting an accelerated project schedule, coordinating with a major roadway project (Las Patrones Parkway), facility planning and design to minimize construction work limits to provide for restoration of native habitat, providing permanent solar power facilities to ensure proper operation, and maintenance of the new facilities. Michael Baker International led the design team, providing the Santa Margarita Water District with professional engineering and surveying services for the project, including hydraulic studies, preliminary and final design, and construction engineering support services. GMU Geotechnical conducted the geotechnical investigation, and Butier provide construction management services.